Singapore Airlines has partnered up with Mediacorp OOH Media to create a contest involving a 3D hot air balloon at bus shelters. This is in conjunction with new flight routes offered by the national flight carrier, including the Singapore-Canberra-Wellington route. To raise awareness of the new routes and Canberra as a destination, the campaign curated experiential moments that travellers can enjoy when they are in Canberra. The 3D Hot Air Balloon was installed on a 6-sheet panel, representing one of the key attractions in Canberra. Four of such creative panels are located in Orchard Road, Paya Lebar, Anson Road and Ang Mo Kio. This ad panel is also integrated with a contest whereby the public is able to select any of the 4 moments – Family, Tranquil, Thrilling and Indulgent and involves a photo taking opportunity with the 3D Hot Air Balloon panel. 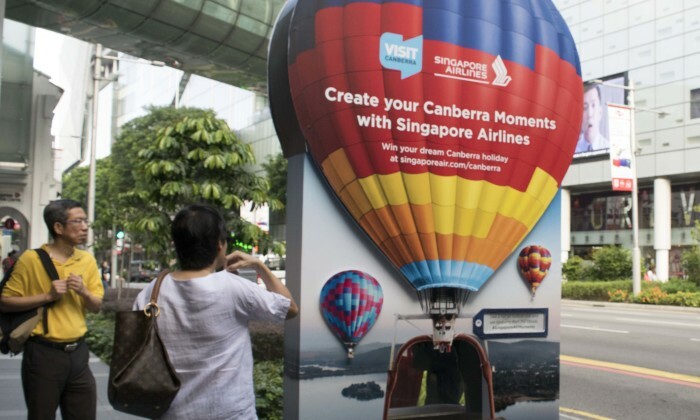 “The OOH execution has allowed us to integrate our digital activities together with offline channels to achieve a truly integrated and holistic campaign,” Alan Lim, area vice president Singapore, Singapore Airlines said. The creative and media agencies involved are TBWA and ZenithOptimedia respectively. The Malaysian Reserve has appointed Habhajan Singh (pictured) as its group editor and S Sivanantham as its chief operating officer..
Can GrabTaxi match Uber’s popularity? Some tout GrabTaxi as one of the best-funded startups Southeast Asia but can it overtake Uber in terms of popularity? ..
To push the campaign on digital channels, the brand's local manufacturer and distributor Permanis is also organising a Wonda Resta..
Zetta Jet recently appointed Epic PR for its PR duties. ..